This is TFviews.com’s review of Toys R Us-exclusive Masterpiece Thundercracker. This MP Thundercracker is based on the TakaraTomy MP-11 Coronation Starscream figure, itself a significant remold from the original MP-3 Starscream, correcting several issues with that original Masterpiece Seeker figure. TRU is charging $69.99, and this is their first Masterpiece Seeker US release after the first 2 – Starscream and Skywarp – were released through Walmart in ’07 and ’09, respectively, with the former released at $49 and the latter at $60, so inflation on the Masterpiece Seekers hasn’t been too painful at least; meanwhile, non-Seeker Masterpieces Rodimus and Grimlock went for $50 and $70, respectively, in the last few years. Keep in mind that Takara release their own MP Thundercracker in ’08 in Japan, but that was a different mold. Masterpiece Thundercracker, exclusive to Toys R Us and based on the Takara MP-11 Coronation Starscream remold, was sighted by my own eyes and wallet yesterday at Culver City, CA TRU, as well as by my friend Bikerscout who found his at Glendale, CA TRU. The pricetag on the set is $69.99 and comes in a keystone box meant to evoke the shape of the original US MP Starscream, only simpler. The instructions on Thundercracker call back to the wrong figure though, using the Starscream v.1 instructions which deviate from this transformation after step 5 of 27. More details will be coming soon. 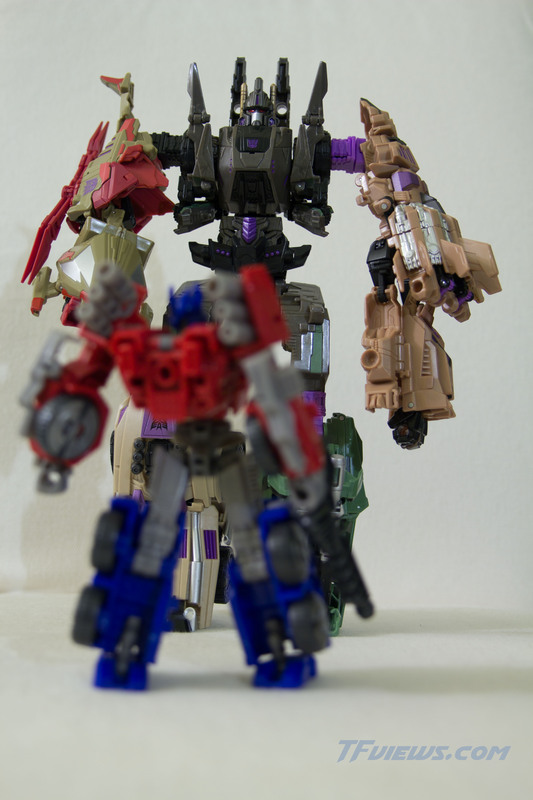 This is TFviews.com’s review of the HasbroToyShop Comic Con-exclusive FOC Bruticus 5-pack. For those who don’t know, this set is an exclusive paint scheme meant to represent the Combaticons as they appear in the upcoming video game, Transformers: Fall of Cybertron. While the mainline releases of the 5 Combaticon figures won’t be coming for a few more months, and the game itself won’t be released for a few more weeks, fans who were fortunate enough to either be at the 2012 Comic Con International in San Diego from July 11th through the 15th, or online at the exact right time when HasbroToyShop’s website released their small held-back cache of sets a few weeks after get to experience the Combaticons as they were originally planned for release, before the character colors were changed to brighter mainline looks. This review will be primarily a photo review, most of you who know my style have seen very long written reviews, but for this review I will list only the broad strokes in brief lists and notes for each character. For those interested, great care was taken to shoot these photos in an extremely natural, realistic lighting so as to present the authentic visual impact of every aspect of this monumental figure set.